So what do u have? After riding 5 different bikes over the past four years, my Mean Streak is my absolute love. 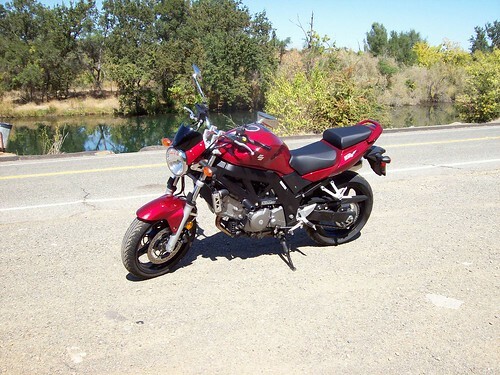 I ride a 2007 V-Star 650 Silveraldo Classic. I got it the first part of December 2007 and I really love it. 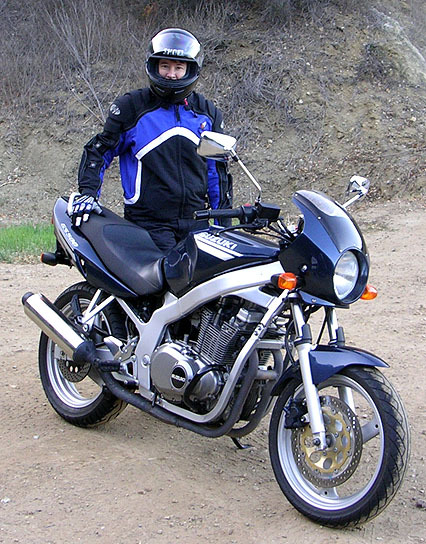 Before the V-Star, I rode a 1988 Suzuki Savage 650 with ten inch extended forkes. That one looks like a chopper. Hope to cruse around the sites and post more comments..
Last edited by whisper15 on Sat Mar 01, 2008 7:39 pm, edited 1 time in total. Ride Often and Ride Safe. you have a pic whisper? Hope to cruise around the sites and post more comments..
Congratulations on your new bike. I'm sure you will love it. My ride is a 2007 Honda Shadow VLX Deluxe. 2001 Suzuki GS500, Sonic springs, Katana shock, 14t sprocket, OEM flyscreen & chin spoiler, billet fork brace, fenderectomy, Diamond links, NGK Iridium plugs. Lowered and lean but not very mean. Hi Teek. Welcome to TMW. We hope you enjoy the forums. And this is it 2 weeks later. We have since polished the engine and painted the front guard. this is me on my little 125cc thumpster, which is a lot of fun! Blues2cruise, thanks for the welcome, and I LOVE forums! Kymford, I am drooling over your 250 (what a beauty!) and your 125 (what a CUTIE)! My hubby has never forgotten his 250, he said it was one of the top faves of his current list of the 46 bikes he's owned so far. If he could have it back, he'd never let it go again. He's a Honda man, but has recently over the last four years jumped badges to Suzukis. But we both LOVE Hondas. My first bike was a '78 Hawk 400. Yes, very nice bikes! Great work on the 750 kymford! We just went to Germany yesterday to pick up a 1991 Suzuki 400 Bandit. Such a cute bike! I thought we would fix it up and sell it but Im so in love that I am keeping it for myself! I love my lil 250, even though i cop a lot of flack about it lol, it is 25yo, kick start and takes longer to warm up than modern machines, but i still love it! I am really looking forward to getting to know you all, this forum seems great. I think Kick starters are so cool! My Suzuki 350 is a kick start, and though it takes me some time to start it I still love it! This is my first time here. I've been riding since the Fall of 2004. My first bike was a 2004 Yamaha V-Star 650 Classic Silverado. I love that bike, but recently, it was time to move up. I traded my pearl white baby for a 2004 V-Star 1100 Custom. Got some ape hangers on it and it's getting me there a little quicker than the 650 did. Luckily, the weather has been beautiful here (until today) and I've been RIDING ! !